You are currently browsing the Carpe DMM blog archives for September, 2010. The only two-part episode in the entire series, “The Menagerie” is easily one of the most memorable. It recycles the previously unaired pilot episode into a framing story that adds significant new elements and drama to the events in a masterful piece of seamless writing. This really is an impressive piece of television. We start at Starbase 11, to which the Enterprise has been called by an urgent signal. The starbase is represented by a matte painting, which looks amateurish compared to the brilliant one for Delta Vega from “Where No Man Has Gone Before”. When we get inside the base buildings, we are treated to a view out the windows which looks like a cardboard cutout of the Seattle Space Needle. But these oddities are quickly pushed aside by the dramatic reveal of Captain Christopher Pike, the previous commander of the Enterprise. Although he says nothing, he is easily one of the most memorable guest characters of the series, as he appears scarred and confined to a wheelchair, unable to move or do anything but communicate “yes” or “no” by causing lights to flash with his brainwaves. While this is a brilliant piece of drama, it’s a bit difficult to justify, especially these days when we are building technology now that allows people to control computers to do arbitrary commands with nothing but brainwaves. Even if you can’t do that and are restricted to flashing a light, you can still use Morse code or something to communicate more than just “yes” or “no”. That niggle aside, the drama really ramps up rapidly, as we learn that Spock has lied about receiving the message and starts acting shiftily. He heads to the starbase computer room, where he uses a couple of nerve pinches to deal with the computer technicians. The mainframe computers are covered in kitschy blinking lights, and Spock uses them to spoof a message from Kirk to the Enterprise to prepare for a top secret mission. Taking the message is a Lieutenant Hansen, who is apparently in charge of the Enterprise while Kirk and Spock are away. This anonymous crew member who we’ve never seen before is third in command? Spock’s behaviour is increasingly bizarre, highlighted by him talking to his old captain, Pike, and saying, “I must, I have no choice.” Knowing what Spock’s about to do, I wonder if he really has no choice… surely there are some options. Anyway, Spock takes Pike back to the Enterprise and warps out of orbit, leaving Kirk behind. Dumbfounded and disbelieving, Kirk gives chase in a starbase shuttlecraft – the first time we see a shuttlecraft in the series. Although this is kind of odd; one would imagine a large starbase would have some sort of longer range vessel available at all times. The Enterprise picks up the shuttle after it runs out of fuel, because Spock refuses to abandon Kirk to drift in space. Spock then gives himself up for court martial on the charge of mutiny. We’re halfway through Part I by now, and if you haven’t seen this episode before it’s impossible to fathom Spock’s motives. The mystery makes it highly intriguing and compelling. During the court martial proceedings, Spock plays footage from an earlier mission, when he served under Captain Pike. This is the footage from the pilot episode “The Cage”, and we see almost all of it during the court hearing over both parts of this episode. In itself, “The Cage” makes for compelling viewing – it really was a pretty good pilot. Dosed out here as a flashback, with breaks in which Spock and Kirk exchange tension-building dialogue, it works even better. Some odd things to note about the “Cage” footage: Captain Pike is seen using a bog-standard clipboard, not the (retro-)futuristic electronic clipboard thingies that Kirk uses. In one scene when Pike is walking through the corridors of the ship, we see a pair of other crew members in mufti, the male wearing shorts and the female in a short cheerleader-style skirt, both looking not much older than teenagers – it’s really weird. When the crew land on Talos IV (the same planet Spock is apparently trying to take the crippled Pike back to), the native scenery includes mysterious humming plants, which are rather funky in a 1960s furniture kind of way. To cut a long story short, The earlier Pike is captured by the Talosians, who are giant-brained telepaths who want to mate Pike with a female they captured years ago to breed a colony of humans for them to run experiments on. Naturally Pike gets rescued, but the cute female turns out to be horribly deformed and only cute in the telepathically induced dream world. The Talosians turn out to be somewhat contrite, apologising because they didn’t realise humans would object so strongly to being treated as captive experimental subjects(!). Before launching into this one, I had to decide whether to change the spelling to Australian English, or use the original American spelling of this episode title: “The Corbomite Maneuver“. I chose to preserve the latter. This is, I believe, one of the more memorable and famous episodes of Star Trek, and for good reason. The story is solid and suspenseful, and there are some strong character moments, sprinkled with the right amount of humour. There’s a truly memorable alien being in Balok, both in appearance and manner. And finally there’s the reveal, which is surprising and interesting if you’ve never seen it before. My first written note as I watched this episode (yes, I’m scrawling notes to remind myself) was that the opening shot of the bridge was a very nice overhead shot – an unusual angle which we don’t often see. It shows off the layout and construction of the bridge in an interesting way. This shot is followed later by an obvious hand-held shot following Kirk as he enters the bridge. It’s the first time I’ve noticed a hand-held shot in the episodes so far. There may have been others, but this one stood out because I was keeping an eye out for the cinematography now. It’s interesting because despite this being shown as episode 10 of the series, it was in fact the third episode produced. Perhaps the early directors were more experimental with their camera work and it settled down a bit later on. I’ll have to keep an eye on that. Being an early episode, this one also takes pains to make sure we see Kirk without his shirt on. We first see him undergoing a routine medical exam in sickbay, performing an endurance exercise. When Spock calls him to the bridge to deal with the impending crisis, Kirk walks out and stalks the corridors of his ship in manly fashion, with sweat dripping off him and his shirt flung carelessly over a shoulder. When your captain patrols the ship with his shirt off, you know he means business. Navigator Bailey demonstrates a nervous trigger-happiness, which turns into a full scale breakdown after the Enterprise destroys the buoy and encounters a much bigger ship. This big ship is commanded by an alien named Balok, who holds the Enterprise in a powerful tractor beam and threatens the ship with destruction. The character moment here is when McCoy reminds Kirk that he promoted Bailey, too early in McCoy’s opinion and based on Kirk’s recognition of Bailey as a younger version of himself. Kirk relieves Bailey, but Bailey dutifully recomposes himself and returns later. 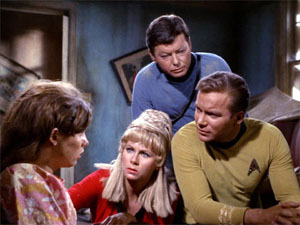 There’s another character moment with Yeoman Rand, which is sad in light of the off-screen events after the filming of 1.8 “Miri” that led to her departure form the series. Here she is seen fussing over Kirk, and after she leaves he states his displeasure in being assigned a female yeoman, saying, “I’ve already got a female to worry about. Her name’s the Enterprise.” The writers were really setting up Kirk and Rand to have an interestingly complex ongoing relationship, which was dashed before it had a chance to develop properly. Balok grants the crew “ten of your Earth time periods known as minutes” to make peace with whatever deities they believe in, before he destroys the Enterprise. Spock and Kirk engage in a chess analogy, with Spock pointing out they are defeated by superior strength, checkmated, before Kirk uses the memorable line: “Not chess Mr Spock. Poker.” Thus is born the Corbomite Device, a spectacular bluff which Balok is unwilling to call. We’ve seen it a million times since, but this episode is where the tense bluff situation really first hit the big time. Kirk then tries to break free of Balok’s tractor beam with some fancy engine work, overloading them way beyond Scotty’s warnings. We are treated to some shots of random crew members being slammed into walls in the ship’s corridors. You’d think the captain would warn his crew to brace or something when attempting violent manoeuvres, but no. Anyway, this succeeds in overloading Balok’s tractor beam and crippling his ship. Rather than leave him, Kirk decides on a mercy mission and beams over with McCoy and Bailey to save Balok. Scotty tells them to bend over, because scans indicate the beaming arrival area has a low ceiling, which brings up several interesting questions concerning what would have happened if they hadn’t bent over. I won’t give away the twist in the ending, but will say that Balok was actually testing the humans to see if they were morally worthy, and everything ends swimmingly. It’s kind of a sleazy test on his part though, as he really had the Enterprise sweating for a while, so there’s a bit of a question as to Balok’s own moral cleanliness. Nevertheless, one can overlook that niggle in an otherwise top notch episode. Trivia for those who know Balok – the same actor appeared many years later as a human in an episode of Deep Space Nine and as a Ferengi in an episode of Enterprise! Tropes: Readings Are Off The Scale (literally! ), Writers Cannot Do Math, Tractor Beam, Puny Earthlings, You Have No Chance To Survive, Trigger Happy, Chess Motifs, Magic Countdown, Take A Third Option, Attack Reflector, The Man Behind The Curtain, Secret Test, One Scene Wonder. This is the first episode for which I couldn’t recall anything about it from the title, before watching it again. So I figured “Dagger of the Mind” probably wasn’t a very memorable episode. And it took me several minutes into the story before I suddenly remembered the important plot elements. The first notable point is that the Enterprise is beaming supplies down to a penal colony planet. This seemed jarring. Given the premise that the Federation is an enlightened society, the idea of penal colonies sounds horribly outdated. Later on, this is tempered (slightly) by the revelation that such colonies are very humane and indeed pleasant places, where criminals are rehabilitated with the best care that the 23rd century can offer. Still, it would be more humane if the treatment wasn’t combined with interplanetary exile. In a ridiculous case of a prisoner “hiding in the laundry van”, an inmate is beamed aboard the Enterprise and, thanks to a moment of inattentive stupidity on the part of the transporter chief, escapes to wreak havoc until captured by a handy Vulcan nerve pinch. The escapee turns out to be a Dr Simon Van Geldar, who displays graphic symptoms of raving madness. Kirk takes Van Geldar back to the prison world (Tantalus V, by the way). But McCoy and Spock, in a rare case of working together against Kirk’s opinion, are suspicious that Van Geldar’s ravings contain a horrific truth about the colony administrator, the renowned criminal psychiatrist Dr Tristan Adams. 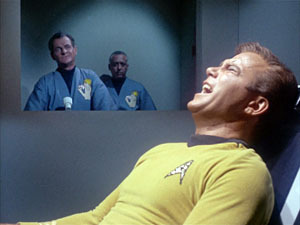 Sceptical, Kirk arranges to beam down to investigate, and asks McCoy to assign him a psychiatric expert from the medical crew. McCoy assigns Dr Noel, who turns out, to Kirk’s surprise, to be a woman he flirted with at the last on-board Christmas party (no, really). This is rather weird – you’d expect the captain to know all the significant members of his crew, especially one of the medical staff who he’d previously flirted with. The two of them beam down to Tantalus, which looks eerily like the lithium cracking station on Delta Vega we saw back in “Where No Man Has Gone Before”. They re-used the same matte painting, with a few of the details modified – in particular the head-banging-danger pentagonal doorway is now triangular! Dr Adams introduces them to Lethe, a former inmate, now rehabilitated and staying on as a therapist, who has wonky eyes and is named for the river of forgetfulness. The significance of this becomes clear when Kirk and Dr Helen Noel are shown the “neural neutraliser” – a spinning light thingy that erases thoughts and makes the subject highly susceptible to suggestion. Meanwhile, back on the Enterprise, Spock uses the Vulcan mind meld for the first time in the series to get the horrible truth from Van Geldar. Dr Adams has gone nuts and is abusing the power of the neutraliser, and used it on Van Geldar to silence him. We cut back to the planet, where Kirk is curious and gets Helen to use the neutraliser on him on a low setting. Dr Adams interrupts the sexual tension and subjects Kirk to more than he bargained for, suggesting to him an unstoppable lust for Helen. This leads to the inevitable kissing scene, but Kirk manfully gets a grip on himself long enough to have Helen crawl through the air ducts to disable the colony’s force field and allow Spock and a bunch of security guys to beam down and save them. Spock manages to arrive amidst more kissing, while Dr Adams is subjected to the full force of the neutraliser and has his brain sucked dry. This episode raises some niggling unresolved questions. We never see Dr Helen Noel again, yet we know that Kirk has what seems like a permanent and very effective suggestion in his mind that he is madly in love with her. There’s no back-story I can find that explains how this is resolved. I could speculate that Helen finds Kirk’s attentions unbearable and transfers to another ship within a week, but this is not supported anywhere. And finally, there is the question of Dr Adams: What caused him to go so deranged that he took pleasure in erasing people’s minds, and why on Earth did he risk being found out by attacking Kirk? As far as Adams knew, he could have shown Kirk around and Kirk would have left, satisfied that Adams was doing a great job. His motives, or non-motivated madness, are never adequately explained. Body count: one nameless inmate of the prison planet electrocuted, Dr Adams killed by the neural neutraliser. I was discussing photography with friends at lunch today, specifically this article about attaching a 102-year-old movie camera lens to a Canon 5D Mark II digital SLR. The sample photos on there are very cool looking. We talked about the trend for photographer to try to emulate the look and feel of old-time film photography. You can of course create some of the old-time photo effects on a digital image with Photoshop. Some people actually go out now and buy cheap and crappy film cameras and take photos with them, and scan them in to share online. That’s cool and good and all. But we pondered reproducing the experience of film photography with a digital camera. Consider a Canon 5D Mark II. If you shoot in RAW mode (as I do with mine), each image file is about 20 megabytes. You find you need multi-gigabyte memory cards to hold a decent number of photos. But maybe you have an old 512 MB card lying around from an earlier camera. That will hold… 25 photos, give or take a couple depending on what you’re shooting and the file compression ratios. A common number of exposures on a roll of film was 24 (and you could usually squeeze a 25th shot in). And so was born the idea. Take your fancy-shmancy digital camera and a memory card just big enough to hold roughly 24 photos. Go out shooting, without any other memory cards. Do not delete any shots you take until you get home. Post all the shots from your “roll of film” to your photo sharing site. This puts you into the mindset of film photography. You only have 24 shots, and you better try to make each one count. And then we went a step further. For a real challenge, find a 32 MB card (or appropriate size for your camera), which will hold only one photo (in RAW format). Go out shooting without any other memory cards. This time, you’re allowed to delete any photos you take. But you only get to come home with one shot. If you think you can improve on the shot on your card, you can erase it and take another photo. if you think you’ve got the best shot of the day, keep it until you go home. If you try either of these ideas, please point me at the results. I wasn’t looking forward to this one, as in my memory it was a rather poor episode. However watching it again I was pleasantly surprised to find it more interesting and dramatically compelling than I’d remembered. The first point of interest is that Uhura isn’t present at her usual station. Communications are attended by Lieutenant Farrell. Immediately after this we see the strangest thing of the entire episode – the Enterprise has followed an “old style SOS” signal and found a planet that looks identical to Earth! Or at least, identical to a globe of the Earth without any clouds on it. The special effects for the Earth planet are really pretty lousy. Presumably because the show was made in 1966 and either they honestly didn’t know what the Earth looked like from space, or the budget was too low to allow the generation of some sort of model with clouds. Now this really is a huge mystery. What in blazes is a planet that looks identical to Earth doing hundreds of light years away from the one we know and love? The pre-credits sequence ends on this tantalising mystery. We have the reasonable expectation that this mystery will be addressed and somehow resolved during the episode. However, the story has a landing party beam down and encounter another completely different mystery, and solve that instead, leaving the question of why the planet looks like Earth not only unanswered but also not even referred to again after the first 5 minutes! This is incredibly frustrating, and also entirely unnecessary. The episode would have worked just as well (in fact much better) if the planet had just been a random alien world. It’s really a puzzle why they chose to set up such a huge mystery and then abandon it. Or maybe not. Because the landing party apparently beams down into the Universal Studios backlot. It looks like an abandoned town from the American midwest. In fact Memory Alpha mentions that it was the slightly modified set of the Andy Griffith Show! Anyway, they look around and a ragged man attacks them. Kirk uses this as an opportunity to punch the guy through the face not once, not twice, but three times, with Spock holding the victim so Kirk can line up the punches. Presumably Kirk instructed Spock not to use the Vulcan nerve pinch when he clearly had the perfect opportunity to do so, just so he could get in some punching practice. McCoy declares the man dead, then adds that he has an “incredibly high metabolic rate”. That’s pretty good – most dead people have no metabolism at all! We eventually get into the main plot, which is that there’s a plague on the planet that (a) slows aging to a rate of 1 month every 100 years, and (b) kills everyone at or past puberty. (It was a deliberate attempt at life prolongation that went horribly wrong.) The result is a planet of 300-year-old children with no adults. I’d expect this to devolve into Lord of the Flies pretty quickly, but somehow the kids have managed to survive and stay carefree for 300 years, although now their food supply is about to run out within 6 months – it’s lucky Kirk and co. came along when they did! In a major piece of plot-induced stupidity, the entire landing party are lured from their makeshift medical lab by taunting from the hostile children, and leave all their communicators behind so they can get stolen. This means they can’t verify McCoy’s vaccine on the ship’s computer, and he has to take the risk of injecting himself with it in the best traditions of TV drama medical trials. Of course it works and the day is saved. The best line of the episode is the closer, when back on the Enterprise Rand tells Kirk that Miri really loved him. 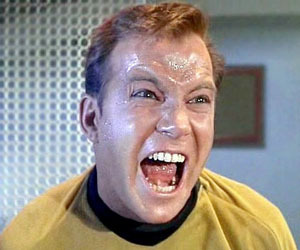 Kirk replies, “I never get involved with older women, Yeoman.” Boom-tish! A great end to an episode with a couple of major flaws, but entertaining and dramatic enough not to be a total loss. Body Count: 1 unnamed old man, and Louise, one of the children succumbing to the disease at puberty. Tropes: Space Romans, Gone Horribly Wrong, The Plague, Only Fatal To Adults, There Are No Adults, Teenage Wasteland, No Immortal Inertia, Kids Versus Adults, Really Seven Hundred Years Old, Unresolved Sexual Tension, Plot-Induced Stupidity, Technicolour Science, Professor Guinea Pig, What Happened To The Mouse? Star Trek 1.7: What Are Little Girls Made Of? Korby: You think I could love a machine? After Korby makes an android clone of Kirk as part of his demented schemes, Andrea serves Chapel and Kirk a meal. Delicious primary-coloured cubes of space gelatine! Mm-mmm. No wonder the android Kirk doesn’t eat any, although the real Kirk apparently enjoys this sort of food. Kirk then sets about seducing Andrea, despite the fact that she’s an android and “not programmed for love”. Being Kirk, he convinces Andrea that she can in fact love. I guess Kirk could probably seduce a cactus into doing what he wants. 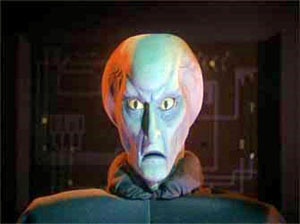 There’s another android floating around: the imposing Ruk, played by Lurch from The Addams Family. It turns out he disposed of the redshirts earlier, and can perfectly imitate anyone’s voice, including Kirk’s and Chapel’s, which he does to capture them at one point when they try to escape. Of course everything goes pear-shaped in the end and Andrea ends up killing everyone who isn’t either Kirk or Chapel, including Dr Korby, who also turns out to be an android in a surprise reveal. So we get an exploration of what it means to be human, or not human, which becomes a common theme in Star Trek as the episodes go by. And I guess now Chapel can go back to lusting after Spock, now that her fiancé has been conveniently killed off. Body count: 2 redshirt security guys. Also 5 androids destroyed: Dr Roger Korby, Andrea, Ruk, Dr Brown, and a copy of Kirk. This is the first time I’ve tried a straight Tempranillo. I’ve had it blended, in the Bodegas Faustino from Rioja, and reading that review again, I can recall the common strands of flavour compared with this one. We took this bottle to an Indian restaurant and had some mild curries and rice with it. It wasn’t a calculated match to the food, but turned out to go together well, in my opinion. 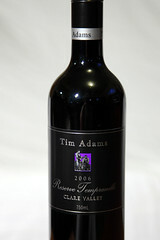 The aroma of this wine, from the Clare Valley in South Australia, is intriguing. It smells quite obviously of strawberries, with a sweetness that approaches spun sugar, almost fairy floss (or “cotton candy” for the Americans). 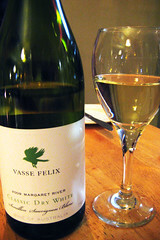 But the taste is not sweet – this is quite a dry wine on the palate. There remains a taste of strawberries, and also cherries. And with them, a spiciness of sweet spices. Cinnamon was the most obvious one, and perhaps a hint of nutmeg. The label on the back of the bottle confirms the red berries and cinnamon, but mentions cloves, which I didn’t really pick up myself. 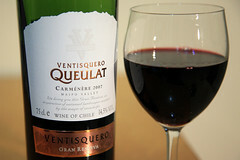 And comparing it to the Rioja, in which I also noticed strawberry and spiciness, I’m now starting to get a picture of the character of Tempranillo. I will have to try another one to cement this into place in my tastebuds and mind. And also because I very much liked it. Wow, I’m ripping through these episodes! I don’t normally watch DVDs this frequently, but I feel like I’m getting on a bit of a roll. Anyway, on to “Mudd’s Women“, which is a bit of an oddball episode. It begins with a chase through an asteroid belt, during which we see Sulu actually at the helm of the Enterprise for the first time in the series. The asteroid belt is, like every other asteroid belt depicted in science fiction, improbably densely packed to the point of being a navigation hazard. During the chase, the Enterprise burns out a bunch of lithium crystal circuits. In later episodes these would more famously become dilithium crystals. Until we learn the women are taking youth/beauty drugs, and one of the miners decides that’s a con. There’s a strange chop in the story at this point, as though they cut a few scenes because the episode ended up too long. Before you know it, Kirk gives one of the withdrawing women her dose of the drug and she becomes beautiful again – only to be revealed that Kirk gave her a placebo, and she was actually beautiful all along, she just needed self-confidence! Rather a clichéd ending to a somewhat disjointed and disappointing episode. What’s more, Harry Mudd returns in a later episode! Ah, the transporter accident. Transporters were one of the great plot devices that Star Trek gave to television. This episode begins with one of the myriad possible forms of transporter failure, and a particularly odd one. 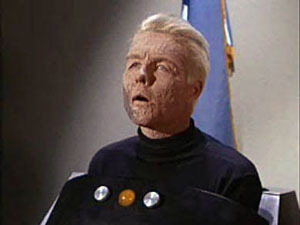 Rather than simply killing Kirk or scattering his component molecules to all corners of the galaxy, it splits him into two halves – a “good” half and and “evil” half. Evil Kirk immediately goes for the hard liquor… and then to Yeoman Janice Rand’s quarters. As it later turns out, this is not so much an evil version of Kirk, but rather the primal, instinctive part of him, ripped asunder from the logical, compassionate part. The resolution of the story requires the two parts to be recombined to make Kirk whole again. But the bad half without the controlling hand of the gentle half gets to indulge all his fantasies and vices freely. So we see again (as in “Charlie X”) that inside Kirk really does lust after Rand, he just doesn’t do anything about it because he’s the captain, damnit! Besides the basic plot, there are some other fun observations to be made with this episode. We see Sulu holding a bizarre dog-like creature (an actual dog with a prosthetic horn) – perhaps his interest in botany has changed to zoology? Whatever the reason, poor Sulu gets stranded on the planet Alfa 177 after the transporter accident that separates Kirk like an egg into his fluffy white meringue and dark yolky depravity. They dare not risk splitting Sulu or the three anonymous crew members who are with him, but rather decide that they are better off freezing to death in -120°F temperatures. Perhaps that’s fair enough, and they do at least try to beam down some inanimate heating units to help them cope – but alas they duplicate and end up nonfunctional. I guess it never occurred to anyone to beam down a few blankets – if they duplicated it would only be extra good for warding off the cold! Also, they never consider sending down a shuttlecraft to pick up Sulu and company. I guess they don’t realise they even have shuttlecraft until the episode “The Galileo Seven” later on. Technician Fisher – the one who instigated the transporter malfunction by beaming up before Kirk with some weird space ore on his uniform – escapes with only a scratch. He is treated by McCoy with a pair of plastic spraypak gizmos that look they would be more at home in someone’s garden to treat aphids than in a starship sickbay treating people with space fever. We’re treated to a cool creepy hand shot when we see the “evil” Kirk appear in a corridor. Spock gets several interesting scenes. He shows off the Vulcan nerve pinch for the second time in the series (the first was in “Where No Man Has Gone Before”). At one point he records a log entry in lieu of the captain, and he calls himself “Second Officer Spock”, not first officer as he is referred to later on. This implies that someone else is the first officer, or second-in-command, at this time. (Or that the terminology was applied sloppily during the early episodes.) Finally, Spock actively displays an astonishing sense of humour at the end of the episode, when he makes an incredibly suggestive remark to Janice Rand about Captain Kirk and his behaviour towards her. I could scarcely believe my ears when I heard it! 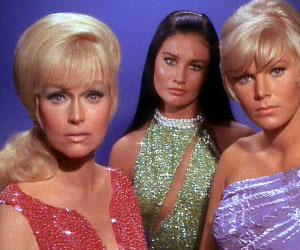 We see the first really good example of Kirk, Spock, and McCoy as the prototypical power trio. The “good” Kirk finds himself indecisive, having lost his conviction to the “evil” version. Spock and McCoy step into the breach, offering advice on what Kirk should do. Naturally, Spock supplies the logical argument, while McCoy completely contradicts him, giving an emotional argument and the exact opposite answer. Kirk, despite being in no real condition to make the decision, makes one anyway. This is a pattern we will see repeated in many episodes to come. A couple of other quick observations: the “good” Kirk conveniently changes his shirt right after the duplication accident, for no apparent reasons other than to show off his bare chest and to provide the viewer with an easy way to tell the duplicates apart. The scratches Rand inflicts on “evil” Kirk’s face magically switch sides during a close-up shot in the final fight scene. And of course the procedure to recombine the two Kirks into the one body is highly dangerous and unproven, but of course Kirk goes through with it (and it succeeds). Body count: No humans, but one rubber forehead dog creature. Tropes: Teleporter Accident, Evil Twin, Literal Split Personality, Shadow Archetype, Evil Is Hammy, Shirtless Scene, Enemy Without, Mirror Match, Power Trio, Number Two.